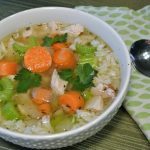 This chicken and rice soup is so quick and easy to make. Actually, one of the beautiful things about making soups in general is that they are all so quick and easy. Once you have homemade bone broth, you have such a flavorful base that it is hard to go wrong. Add organic veggies and pastured meats to your nourishing bone broth and you have an easy meal loaded with nutrition. Also, there are no rules! Add whatever you like: leftover veggies, leftover noodles, root veggies, herbs from the garden, etc. Combine this soup with a large salad and a hunk of crusty sourdough bread and you’ve got a meal. In a dutch oven or heavy sauce pan, saute the onion over medium heat for about 5 minutes. Next, add minced garlic and saute until fragrant. Then, add chicken bone broth and bring to a soft boil. Toss in carrots and thyme and simmer for 10 minutes. Add celery and roasted chicken and simmer an additional 5 minutes. Finally, add leftover rice and serve! So easy and quick! A quick and easy nourishing soup. Add chicken bone broth and bring to a soft boil. Add carrots and thyme and simmer for 10 minutes. Add leftover rice and serve! So easy and quick! I like to add chopped fresh parsley right before serving for a little freshness. Do you love making soups? What are your favorite soups to make? Previous Post Bone Broth: Have you Jumped on the Bandwagon yet?